STAR KID, a game I made for the PG Jam in about six hours. You're Star Kid, and you're looking for space candies! Use your controller or the keyboard to play. Use the ARROW KEYS to move, and press the Z KEY to launch starbursts. As you collect the Green Candies, powerups become available. Activate them by pressing the X KEY. Go for a high score! There are six different power-ups in the game... Have you seen them all? PROTECTO-SHIELD: Stop a couple enemy projectiles and crates from damaging Star Kid. TRIPLE-SHOT: Launch 3 Star Shots at once, instead of 1. REPAIR BOOST: If injured, this restores Star Kid to full health! STARSHOT SALVO: Provides a small score boost and a wave of Star Shots that fly from the bottom to the top of the screen. Any that make it to the top edge turn into candies. RAINBOW MODE: Ridiculously-coloured and distracting visuals, but provides a great score bonus while it's in effect! SCORE BONUS: Nothing special... Unless you'd like a 2,000 point bonus! The PG Jam was hosted on Itch.io in late November. The theme was that all games entered would be family-friendly. I was thinking of my nephews (who are both gonna be 6 years old) while making this, and I figured they would like the visuals. More mature/experienced players will enjoy the powerup mechanics, skill shots, and the various ways to maximize their score. My first 1 Hour Game Jam entry. Theme is "Moon." In this game, you mash certain keyboard buttons to transform people into werewolves. Made in Clickteam Fusion Dev. Sounds made with BFXR. For Windows only at this point. Enjoy! An art game brought to you by Smedis2. This is inspired by netgrind's SSSnake series (which was made into the compilation game Snakes on a Cartesian Plane). It was also primarily inspired by the "dreams" in Run, as well as DefeatMe. Eat the yellow squares. Eating two yellow squares will create a new snake for you to control, turning the old snake into a looping obstacle. Arrows - direct the snake. You can wrap around the screen. Other keys - press when you die to restart. Instructions: Click on the white space and press 'Enter' to BEGIN YOUR JOURNEY!!! FFF is a voyage into new perceptions that will BLOW YOUR MIND. Play as Zemog, a one dimensional being who has gained the power, through a red pixel, to traverse dimensions and travel in height through the SECOND DIMENSION. The fun is only outpaced by the expansion of your mind. Experience TRUE ART through FFF! 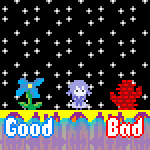 Here is a little game about a glitch. Enjoy. Move with arrows, jump with z.
Ostensibly based on Pixel Perfect, but inspired more by Pixel Perfect 3.5: Fan Mix.